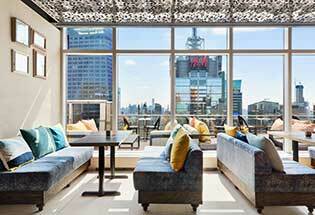 Voted The #1 Party In Times Square with 6 Floors of Fun! Tickets for AMC 42nd Street NYC New Years Eve 2020 are currently not on sale. Take your New Year’s Eve celebration to the max and spend the night partying in the country’s most popular multiplex – AMC Times Square! Located in the heart of Times Square boasting four unique, fun-filled floors, this is what you call the ultimate Times Square New Year’s Eve entertainment at it’s best. Step out of the cold and into the dazzling, mega-watt celebration at AMC Times Square, undoubtedly THE place to be in the heart of Times Square on NYC’s busiest night! AMC is the premier movie and entertainment complex located right on 42nd street, just steps from the World Famous Ball Drop. This popular destination for locals and visitors alike will open its doors for an exclusive ticketed event for individuals of all ages – with three unique parties and experiences to choose from! FAMILY ENTERTAINMENT All Ages Level 3 (For Families & Guests 8+) – Welcome to the fun zone! This all-ages, family-friendly level is perfect for kids and adults of all ages who want a night of New Year’s Eve revelry! Hit the dance floor as a DJ spins the latest top 40, hip-hop, electronic and rock favorites! Concession stands will be offering your favorite movie time snacks and favorites, as well as fountain drinks for purchase. As the clock strikes midnight, celebrate the New Year with a live NYE countdown and festive NYE party favors. The patio on this floor will NOT grant you a view of the live Ball Drop. OPEN BAR GALA – Levels 4 & 5 (For Adults 21+) – Ready to party the night away and ring in 2019 with a high-energy, over-the-top, fist-pumping good time? Welcome to the Open Bar Party! We’re transforming these floors with a surprise twist in velvet-rope nightlife that will make you forget you’re in a grand luxe movie theater! For one night only this theater rocks like an A-list hotspot complete with open bar service, a world renowned DJ spinning the best hip-hop, electronic, rock and top 40 hits to keep you grooving all night. Party like a rock star with Ultra VIP and Platinum table and bottle service packages! And it doesn’t stop there – the latest Hollywood hits will also be playing all night long! Capture the most exciting moment of the night with spectacular views of the crowds of revelers below and best of all, the world famous Waterford crystal Time Square Ball Drop along with the live countdown to 2019! 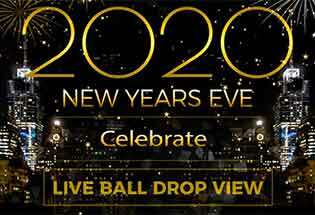 Terraces are reserved strictly for “Premier Terrace Live Ball Drop VIP" or 'Best View of the Ball Drop Live VIP” ticket holders only. From 5 or 6 stories in the air, viewing the Waterford Crystal Ball down 42nd Street will never have looked so dazzling and bright! It feels like you could almost touch it so set your sights on the hottest ticket of 2018 at AMC Times Square! This is truly a once-in-a-lifetime experience!